Imagine trying to mollify 400 municipal health workers who have been told they will be changing employers, job descriptions and possibly workplaces - with only half their senior management in place. Imagine that, and you will have a picture of what the Foundation for Professional Development (FPD) and their partner, the newly formed Nelson Mandela Bay (NMB) health district management, took on - with amazing success so far - in the often strife-torn NMB (Port Elizabeth, Uitenhage and Dispatch) Health District in the Eastern Cape earlier this year. While national political battles about dismal Eastern Cape patient care raged on above their heads, the FPD quietly facilitated a pivotal three-day pilot workshop to 35 senior and middle managers of provincial and municipal healthcare facilities in the NMB Metropole. Its purpose was to turn around the high absenteeism, negativity, staff turnover and poor-quality service delivery by doing an almost unheard of thing - actually hearing the gripes of managers before getting them to identify what they were doing well, and what they could do better. 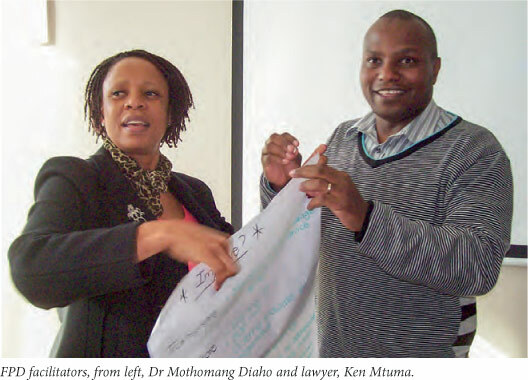 Led by Dr Mothomang Diaho and lawyer, Ken Mtuma both specialising in change management facilitation, the workshop began with participants displaying closed body language and complaining angrily about perceived loss of benefits (by municipal staff) in the new salary structure. On the first day, people sat divided on opposite sides of the room. Yet, as discussion opened up with information, challenges and benefits emerging, the two 'sides' slowly merged and became more animated. By the third day, there was no talk of 'us and them', and managers were enthusiastically identifying weak areas where quick, inexpensive solutions were most easily achievable. According to Suzanne Johnston, Cluster Head of the FPD's Technical Assistance Division in Pretoria, by 4 pm on the last day nobody was 'reaching for their bags. Instead they were making appreciative speeches to the facilitators, noting how rarely such connecting and empowering events happened. The turnaround in attitude came in spite of there being no provincial district manager, district information officer, district health planner, district tuberculosis (TB) manager or district quality assurance manager at the time of the workshop (in May this year). The district manager post has since been filled, and prime candidates for all other positions had been identified and were about to be hired by November 2013. The managers, old and new, have their work cut out. Overall, not only have the 400 former NMB Metropole municipal healthcare staffers - whose jobs previously focused more on preventive healthcare delivery - been absorbed into a (previously exclusively provincial) curative healthcare culture, they have had to deal with massive rationalisation of equipment and administrative systems, including supply chain management and widespread individual skills expansion. The catalyst was their (now ex) Head of Department, Dr Siva Pillay, finally grasping the nettle created by the new National Healthcare Act (2003), which insists on a single provincial healthcare delivery vehicle. Explains Kobie Snyman, a midwife, 30-year veteran of the province's healthcare administration and recent recruit to the FPD's staff (Head of the NMB Technical Assistance Team), 'the old system was creaky, expensive and not working very well'. To get some idea of the human resources challenges the NMB Metropole (population 1.2 million) faces, the larger Cacadu health district surrounding it (population 400 000) has three formal sub-districts with 64 healthcare managers in place (each healthcare sub-district is supposed to have 20 middle managers in place, supporting a sub-district manager). NMB Metropole has 20 managers altogether, and has yet to be demarcated into sub-districts - meaning it has the least number of managers of any health district in the entire province. The FPD, an independent legal entity, was originally set up by the South African Medical Association in 1997 to help build a better society through education and capacity development. Its mission is to catalyse social change through developing people, strengthening systems and providing innovative solutions. Its technical assistance team, funded through the US President's Emergency Plan For AIDS Relief (PEPFAR) and US Agency for International Development (USAID), is behind what will be a four-year partnership with four health districts in the Eastern Cape designed to strengthen their healthcare systems. Snyman, whose experience in the Eastern Cape Provincial health service bolsters her ability to help manage the complex transition, says a provincial steering committee with a number of task teams was originally formed, embracing senior municipal health officials, politicians and labour union representatives. Out of this came a human resources task team, a service delivery task team, and infrastructure and supply chain management teams. The facilitated workshop that followed in May this year was 'just a minor part' of the greater merging, but will probably have a disproportionate impact as it is repeated down the ranks - until saturation level is reached. Other Eastern Cape projects the FPD is involved in are a mobile computer lab with 20 work stations (there are two others deployed to Limpopo and Mpumalanga) parked at a central health facility to train staff on data capturing (e.g. for HIV), data interpretation and management information systems. Snyman says one intention is to get all healthcare managers and professionals to 'understand what their indicators measure, so they can use them for quality control and planning'. The FPD rents a mechanical horse (truck) to move the wheeled container from site to site, leaving it for a week at each venue and remaining in a single health district for between a month and six weeks. 'Our training schedule has to be drawn up well in advance so people know what's coming and when, and can get the best use out of it,' she adds. One boon has been the recruiting of IT interns to help train healthcare staff for free. This meant that 80 people were recently trained in both health information systems and HIV/AIDS data management in the NMB Metropole over six weeks. The FPD is also pioneering fully-equipped cervical cancer treatment 'learning and mentoring' centres in the province. Doctors and nurses are taught the very latest treatment for this condition which, because it is so often belatedly detected, far too often ends in long-term cancer treatment or even death. Screening for cervical cancer became national health policy in 2002 but because of a lack of funds, implementation was fatally slow, especially once the HIV pandemic (which aggravates cervical cancer) took off. In more recent years antenatal clinics and community health centres in the Eastern Cape have improved cervical screening and quality specimen taking, resulting in a strong flow of patients to the FPD-sponsored facilities, the first of which has just been set up at Uitenhage and Butterworth hospitals. The FPD provides district-level assistance to provincial health departments via a five-year, R750 million PEPFAR/USAID technical assistance grant (October 2012 to September 2017) aimed at sustainable health systems strengthening.